Drunk driving is sometimes referred to as Driving under the Influence of Alcohol or Drugs ("DUI") or Driving While Intoxicated ("DWI"). 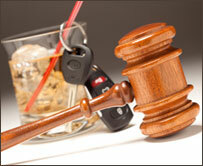 DUI is a serious criminal offense, one that must be addressed immediately. Rights can be lost without prompt action. Unless done properly, you could lose your driver's license without a hearing! At the Law Office of Mark A. McLaughlin, Northern California (Antioch, Pittsburg, Brentwood, Concord, Oakland) criminal defense law firm, we know how to proceed after a DUI arrest in a timely manner, protecting your freedom and your rights. YOU HAVE TEN DAYS FROM THE DATE OF YOUR ARREST TO DEMAND AN ADMINISTRATIVE HEARING FROM THE DMV. We have an exceptional record at these hearings resulting in many clients' retaining their driving privileges. We also can advise you on how to obtain a Restricted License if you lose the hearing, shortening the normal four-month suspension to thirty days. We will explain to you the pros and cons of requesting a "Stay" on your suspension to allow you to drive until your hearing with the DMV. We work hard defending our clients arrested for drunk driving. After many years of experience defending DUI/DWI cases, we have an in-depth knowledge of California DUI Laws, the court process, Department of Motor Vehicles ("DMV") licensing hearings, and all aspects of California DUI defense and related matters. We represent many clients from outside of California who get arrested while visiting here. Our office can make all court appearances for you, thereby allowing you to continue working without interruption. We know DUI arrests can be embarrassing and do everything possible to handle this confidential matter in a sensitive manner. If you have been accused of driving under the influence of alcohol or drugs, DUI, DWI, or any other driving offense, you need to speak with us immediately. Please contact us at (925) 754-2622 and we will aggressively protect your rights and your freedom.